The Smurfs 2 is an Action-Adventure Platformer game that follows the thrilling story of the second movie of the Smurfs that takes place in New York and Paris. Players will take control of their favourite blue heroes to succeed on their quest to rescue Smurfette from the evil Gargamel. The Smurfs 2 video game is an action packed adventure platformer that provides Smurfs fans of all ages with the opportunity to dive into the magical Smurfs Village and relive iconic moments and key environments from the feature film. This item is FREE delivery. 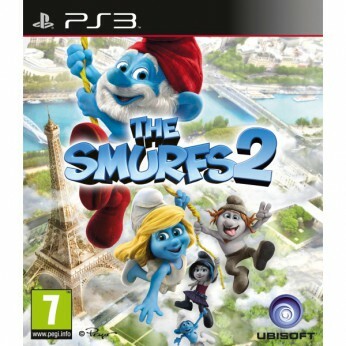 Suitable for the PS3: Players assume the role of a Smurf and immerse themselves in an interactive adventure through the movie’s enchanting environments including New York City and Paris and expand their movie experience into worlds exclusive to the video game such as the Arctic Tundra and the Lava Jungle. Fans can follow the Smurfs adventure solo or by playing cooperatively with friends. As players progress in the game, they will be able to choose between nine Smurfs featured in the movie and can join each other in a fun multiplayer experience of up to four users playing simultaneously. Each Smurf has their own special ability to use when navigating through more than 30 levels in six different worlds. Whether playing as Papa Smurf throwing magic potions to stun the enemies, stomping onto enemies as Grouchy Smurf or striking a pose as Vanity Smurf to provide a platform for other players to reach hard to get items, each move will be used to aid in the battle against enemies such as Azrael, Gargamel the Evil Wizard and Gargamel’s Naughties. For ages 7 years and over; EAN/MPN/UPC/ISBN: 3307215713020. This toy costs approximately £29.99 (for the latest and best prices make sure you check our retailer list for the The Smurfs 2 PS3 above). In our review of The Smurfs 2 PS3 we classed it as being suitable for ages 4 years, 5 years, 6 years, 7 years, 8 years, 9 years but recommend you check the manufacturer specific advice before purchasing.